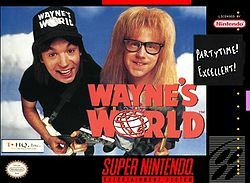 Based on the movie, Wayne's World for Super Nintendo has you play as Wayne Campbell in an attempt to rescue Garth from his kidnapper, Zantar. He's armed with a guitar and the power to Schwing that will help him defeat the enemies inhabiting Kramer's Music Store, Stan Mikita's Donut Shop, the Gasworks nightclub, and suburbia. In each location, the assailants include monster bagpipes, accordions, coffee cups, disco ball, and headbangers.